Sports and cabrios | What Car? 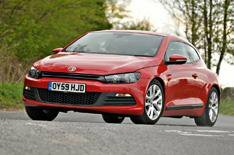 It was a case of oh so close for the Volkswagen Scirocco in the 2011 survey. In its first year in JD Power it lost out by just 0.4% to the category winner (the Mazda MX-5) to take a solid second place. This year it went one better, claiming the top spot in the sporting cars category. One clincher, perhaps unsurprisingly, was its visual appeal, with the Scirocco scoring impressively highly both inside and out. Owners were also rather taken by this coups practicality, with the seats and storage coming in for special comment. The rear seats were about the only element that drew anything other than high praise, with head-, leg- and footroom not finding universal favour. Practicality isnt the Sciroccos main strength, though; drivers preferred to concentrate instead on the responsive steering, and on having fun putting the cars nimbleness to the test on country roads. Drivers also appreciated the Sciroccos overtaking ability at motorway speeds, and its smooth gearchanges. By and large, owners were able to enjoy their Scirocco without interruption, although theres still room for improvement here. The heating, ventilation and engine performed particularly well, although owners did report a surprisingly high number of issues with the tailgate. Only Mazda MX-5 owners recorded fewer overall problems with their sports cars, but the Sciroccos strong all-round performance means it gets top billing for 2012. A surprising drop in the popular roadsters overall score means it loses its Sports Car title this year. Owners remained taken with its reliability, driving ability, looks and servicing, but this enduring Mazda fell down on running costs. Z4 owners reported a few issues with their cars audio systems and dashboard displays, and they were less than impressed by the competence of their service advisers. On the plus side, they loved the cars interior, seats and handling ability. Reality bites for the TT as it drops to joint-fourth (final) place. Pace and handling were praised, but a higher-than-average number of battery and clutch problems brought the score down. Insurance, fuel and service costs were all criticised. A disappointing lowest score for the second year in a row for Mercedes sporty SLK, albeit shared with the Audi TT. The car also suffered a fall of 27 places in the overall satisfaction index, after last years problems reared their heads once again for owners. Squeaky seats, irritating floor mats that wouldnt stay still and problems with the speedo were just some of the reported issues that took the edge off the ownership experience, while high car-collection charges by the dealerships were unpopular as well. The SLKs classy interior won praise, though, as did its looks. My Scirocco suits my needs perfectly. Aside from being stunning to look at, its very comfortable on long journeys and versatile around town, never delivering less than 50mpg. Theres more than enough power and torque and, with the adaptive chassis control, it sticks to the road like glue. Ive no problem fitting family and friends into it, and find the boot space more than adequate. I had a problem with a squeak from the rear of the car, but VW sorted it in a day under warranty.